I would have liked to seen this data shown since the July peak, but whatever the case it is always interesting to see what has been hit the hardest and what has held up whenever we get this dramatic swoons. Bespoke created a table below showing the major ETF classes. No surprise the Europeans have been hit the hardest but a bit surprising Germany (which has been a star during this recovery) has been thrown out with the bathwater. 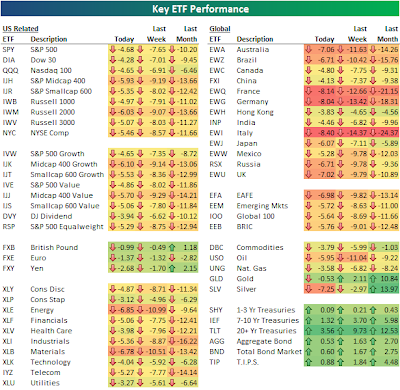 Back in the U.S. midcaps have suffered the most in terms of market cap, while the cyclical growth sectors (no surprise) have been hit the hardest as questions about a double dip arise.